You may recall that the 1st quarter of sales this year showed a remarkable increase in the number of residential sales as compared to that of the 1st quarter of 2013. 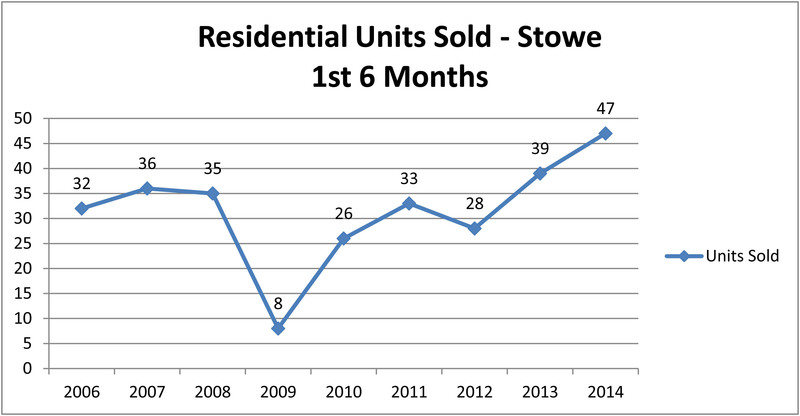 At the end of the first 6 months the sales data shows yet another increase comparatively; this time up 21%. Consumer confidence, buyer demand, low interest rates, and ongoing decline in inventory, continue to influence this trend. Although residential inventory began to increase a bit at the beginning of June, the overall amount ended up lower by the end of the 2nd quarter - down 11% - which represents a 14 month supply. The median and average residential sales prices increased, 35% and 4%, respectively. Condominium sales were up significantly at the end of the second quarter, by as much as 67%. The amount of inventory decreased slightly by 6%, leaving a 23 months’ supply. The median and average sales prices dipped 21 and 29%. Although projections for land sales were indicating an increase, they were actually up more significantly than thought – to the highest number since 2006. The number of listings declined as much as 29%. The median sale price of $170,000 was a bit lower than last year at this time, 17%; whereas the average increased 47%. The chart below shows a continued increase of home sales up to $500,000, which increased about 21%. Home sales for the 1st 6 months of the year between $500,000 and $1,000,000, represent 40% of all sales, down slightly from last year. The luxury market segment, above $1,000,000 increased slightly from 4% to 9%. 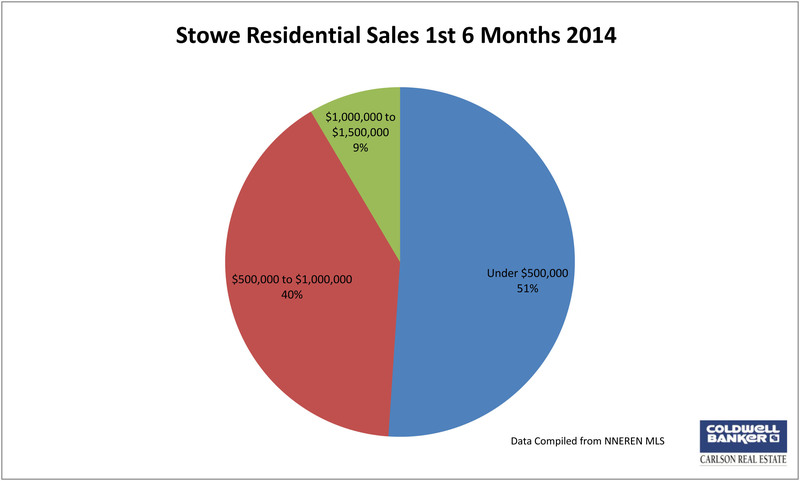 North of Stowe, the rest of Lamoille County saw an increase again in residential sales after the 1st 6 months of sales - up 11%. The majority of those sales, were again, under $200,000. The median sales price did not change and the average price was up 8%. 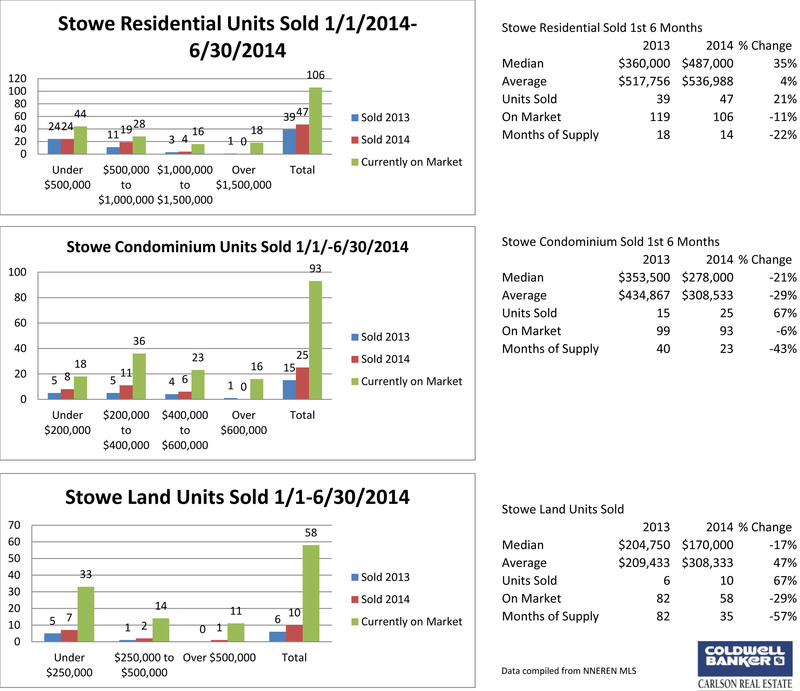 The Inventory level remains the same after 6 months of sales, compared to last year. 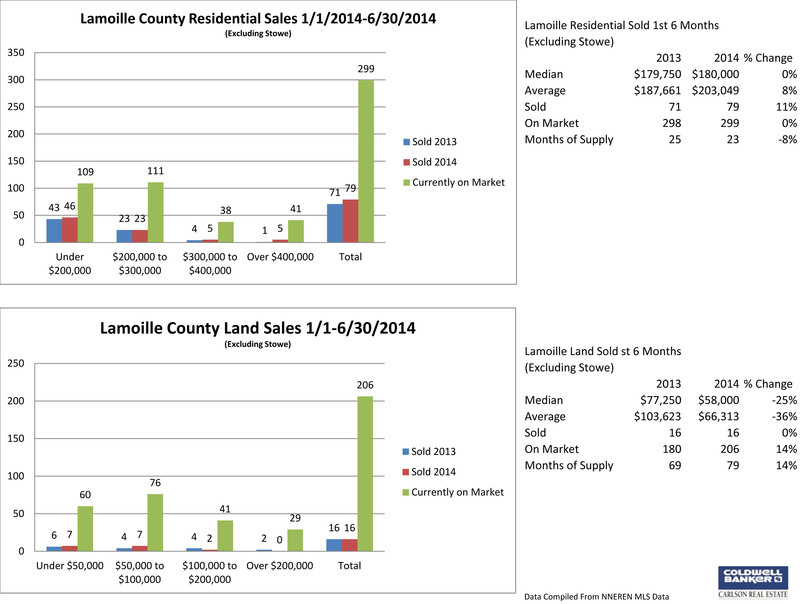 The number of Land sales did not increase, but inventory did by 14%. 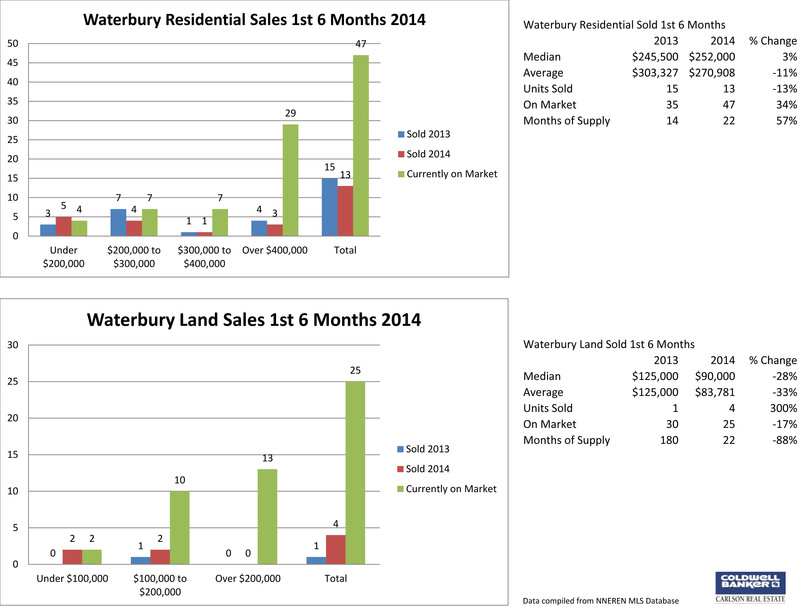 Although the Waterbury residential market showed a slight dip in the number of sales - by 13% - the sales market there is currently very active. There are 8 homes under contract right now, which is more than there were at this time last year. The median price increased slightly by 3%, whereas the average went down 11%. 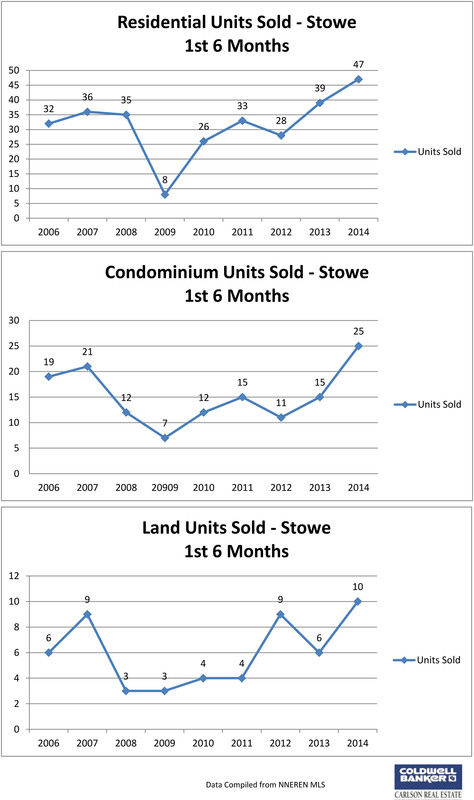 Like Stowe, land sales in Waterbury increased significantly, although the median and average prices both fell. The number of land listings is down by 17%. “Like Stowe itself, Coldwell Banker Carlson Real Estate is unique and grounded in the concept of quality first”. We look forward to another busy summer of assisting all of our Customers and Clients with marketing, buying and selling properties. If you have any questions about this report, or would like any additional information or statistics, please feel free to contact me at anytime.